Cesenatico, the hometown of Marco Pantani, where, you can ride the hills from the Adriatic Sea to the Apennine Mountains. Visit pristine villages and vineyards by bike. This is where the pros go to train. Actually, in our hotel, you might bump into a professional cyclists from team SKY, Lampre, Astana, Columbia and many others. 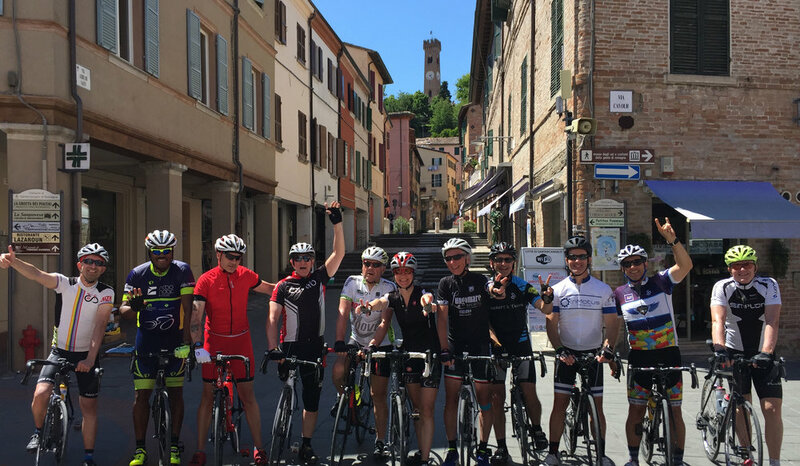 After four days of exciting rides we then transfer to the hidden gem of bicycle lovers; Peschiera del Garda. Lake Garda is the largest of the Italian lakes and offers an abundance of colors and scents of the near-by vineyards, a landscape perfect for a variety of cycling tours. Close by are the Morenic hills, with their ancient villages surrounded by the Valpolicella valley filled with vineyards and fascinating olive trees. Than if you wanna conquer an historic mountain peak...there's always Monte Baldo! Welcome to CESENATICO, WHERE THE CYCLING PROS GO TO TRAIN BEFORE THE GRAND TOURS SEASON. From cesenatico, we’ll travel to peschiera del Garda and the Dolomites. The roads around the lake make for flat and easy riding, unless you would rather challenge yourself with of one of the many winding destinations of the Dolomites where exciting stages of the Giro d’Italia are raced each year. It's a feast for the eyes and the stomach. The home and renowned Cantina Agricola of world cycling champion Francesco Moser is only 15 minutes up the road. In his racing days, Francesco was focused on winning the Paris-Roubaix Classic or the Giro d’Italia, but today he shares his stories and victories around a table axed out of an enormous tree in his private wine cellar where most of his vintage vine is stored. 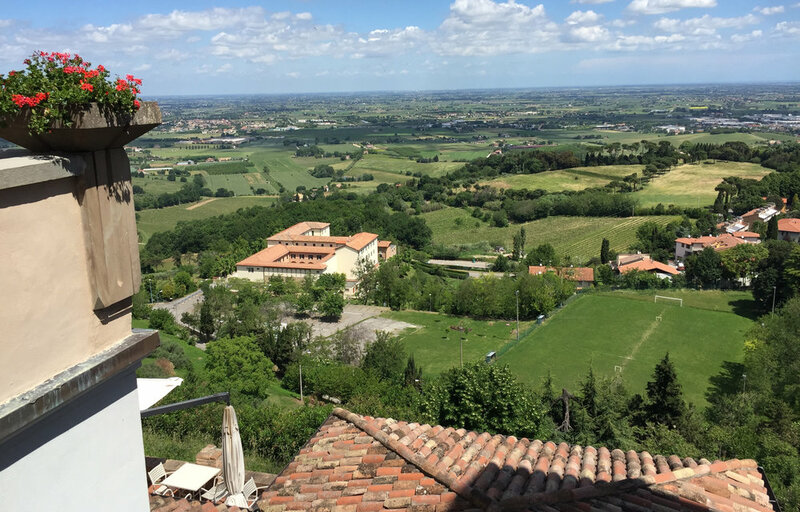 A visit to the spectacular “Museo della Bicicletta” on top of his Cantina, together with a delightful wine tasting, with aged salami and cheese is a must of every bicycle pilgrim. As part of tour, you will have the pleasure of experiencing such an encounter with Francesco. After a bike fitting at the hotel, this ride takes us on a route of gently rolling hills, warming up our legs on the day of arrival. The most striking element of this region is the stunning and dramatic scenery in every direction. The ride constantly presents views filled with old castles, blue lakes, and medieval villages. Even though we are in season, we choose a route where not only are the roads in excellent condition, but cars are few and far between. After a tantalizing introduction to the area, we return to the hotel for dinner. This is a fantastic cycling route, incorporating the climb of Passo Ballino, The ride along the canyon of Limaro and the final descent to the Sarca Valley makes for a thrilling ride The beauty of this landscape and spectacular scenery make this tour the perfect choice for riders who simply want to enjoy a day of cycling along the famous roads of Garda Trentino. Riders will be amazed at the way we are able to weave in and out of the classic vineyards in this area, getting so close that you can almost reach out and grab the grapes on the run! The lunch break will give us the opportunity to experience the vineyards first hand. The roads are perfectly surfaced and there is very little traffic. We will travel through two fully lit tunnels along the way. Get ready to be elevated! Starting close to sea level, we gently ride uphill until we reach 1000 meters at Passo del Duron, the highest point of our tour. Staggering panoramic views near Lake Tenno and the vistas of the Bleggio region give us a great view of the Dolomites. Every challenge up these magnificent mountains comes with its own reward, and at this point, we are free to ride like the wind on our way back down. With perfect road conditions and very few four wheeled objects on the road, we set out on our way down the mountain. Viva Italia! If you are in the mood for some serious climbing, then this is your day… The conquest of the Monte Baldo will become part of your list of accomplishments you will be bragging about to your friends and family for years to come, and it will be deserved! The road takes us from Avio up the hill to Passo S.Valentino. It’s one of the most spectacular climbs of the Trentino region, with beautiful panoramic scenery all the way to the top. After a breathtaking view at the summit and picture taking, you will be ready for an awesome ride down the other side of the mountain. On the way down, we stop and one of our favorite locations to have a leisurely lunch and refreshment, a much deserved gift after the work of reaching the summit of Monte Baldo. We continue on down into the valley towards the lake, with a view that will have you talking for days. Enjoy! With perfect roads ahead of us, here is one more chance to scale a mountain of challenging proportions. We ride up the challenging course of Granfondo Charlie Gaul, just part of the way with the famous climb of Monte Bondone. It’s a tough one, so get psyched and hang on. If you are not feeling quite that energetic, then we have the perfect alternative. Get ready for The Lake Garda Classic. Spectacular views are calling as we cycle around the edge of Lake Garda. Smooth flat roads, mountains to the left and the right, and sunny villages one after the next greet us as we pass through on our journey around this magnificent lake. We ride for 70 kilometers and stop for lunch at one of our favorite restaurants. What a stunning way to experience this Alpine region. It’s time to take a much more relaxing route without any serious climbs. Gently rolling hills, beautiful scenic vistas, and the great company of fellow riders await us as we cruise the Garda valley. On our left we will notice hundreds of people scaling the high cliffs in what is one of the world’s most renowned rock climbing areas. Perfect road conditions all the way make this route of 70 kms a day of pleasant, relaxed riding. After breakfast transportation to the airport will be provided.